Need more than just screenshots? Here is actual archive of the seller page. 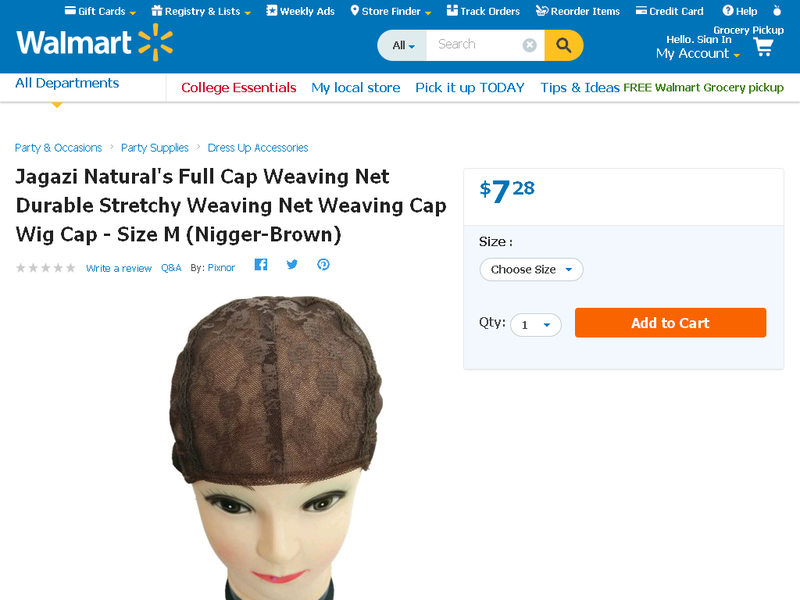 When the screenshots were originally released, putting the shopping mecca on blast, Walmart immediately tried to cover up the racist description. They began by changing the title and description, but forgot to change the URL, so the fire-storm continued. As we were writing this post, the product went from out of stock to completely unavailable on Walmart.com — but as you know, it was already too late. I'd thought this was a photoshop to make fun of Walmart's racist Tipi baby wear the other day. .Where exactly is that racist slur on the color wheel? Next to cracker white? Although the wig caps were not actually being sold and shipped by Walmart but instead by a seller named Pixnor, the outrage is still righteous because the question has to come up: Why didn't Walmart look into what their affiliates are selling? The most upsetting part about this story is that we know this won’t be the last time brown beauty is going to be insulted. Sad.